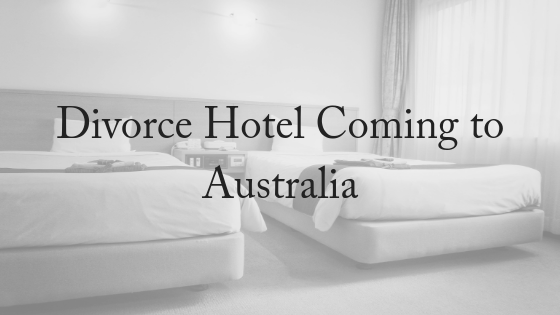 It’s official: the divorce hotel is coming to Australia. The premise is simple: couples check in to a hotel in two separate rooms for two nights, where they undergo mediation processes behind closed doors and away from outside responsibilities. The idea is that, over the course of a 48-hour hotel stay, all divorce arrangements can be made, but it goes without saying that this kind of arrangement will only work for people on amicable terms when parting. Divorce Hotel is the brainchild of CEO Jim Halfens. He came up with the idea after witnessing his best friend’s “extremely messy” divorce, says David Leckie, global director of DivorceHotel International. His idea involves providing all the professional support a couple need to arrange their divorce (“lawyer, mediator, financial advisor, maybe therapist”) all under the same roof at the same time. Halfens developed the idea in the Netherlands around seven years ago and the company is now operating in the US and the UK, with an Australian expansion planned for 2019. Psychologist Sharon Draper says a “weekend divorce” could help “soften the blow” of divorce. Because the Family Court of Australia decrees a married couple must be separated for a year before they can file for divorce, ideally both parties will have time to reconcile their differences emotionally so they’re ready to get down to the finer details of the split. However, she believes the process wouldn’t work for everyone. Draper says couples with older children may also benefit from involving them in decisions about splitting their time between each parent’s residence. However, such details could be worked out at the hotel and then confirmed with their offspring later. Couples who have been attracted to the service say that it is a perfect way to get a divorce if you are still amicable with your partner and want to remain friends after a divorce. They see that the traditional divorce system works against these aims and can create animosity between the parties. Others have said that that the process allows them to come to a decision with their partner free from influence from other family members and even friends. It allowed them to think about what was important to them without being influenced by others. The process also allowed them to have breaks if they needed to and the hotel provide activities such as cycling, walking and has a spa too which helped the couples clear their minds. Placing pressure on couples to agree a settlement within 48 hours may not achieve the best result for the parties directly involved but also for their families. The parties may not stick to the agreements they have made if they have been made hastily and in a last ditch attempt to settle matters. An added layer of pressure is placed on the parties when they think about how much they have paid for the weekend. They don’t want to come away and have to instruct solicitors to go through the process again. Pressure can also increase the amount of mistakes made by the parties. They may forget things that are important in terms of the finances for example assets obtained before the marriage. If a mistake is made, it is very difficult to then change the agreement that has been made. It can also be expensive. In Australia, mediation is strongly encouraged and couples can only divorce if they have been separated for 12 months or more. Attending mediation is not compulsory when the parties have reached an agreement on how to settle their property and are satisfied with the parenting arrangement they have worked out together. Nor is it compulsory in the case of family violence or the matter is urgent. But you do have to attempt Family Dispute Resolution before you can take your matter to the Family Court. It’s been shown that as well as positive short term effects there are positive long term effects for couples and their children who choose the mediation process. A study that looked at the long term effects of mediation found that those parents were more satisfied than their more adversarial counterparts 12 years down the track and they were able to discuss and resolve problems with greater frequency. At Divorce Lawyers Brisbane we aim to help you have a divorce that is as conflict free as possible. Our lawyers are skilled at mediation and always believe in putting the best interests of children first. To speak to one of our experienced family lawyers please contact us today. We offer a free, 10-minute phone consultation.